Joe Foster of Hyper Sport Engineering reports that rumours of the team's demise are premature. 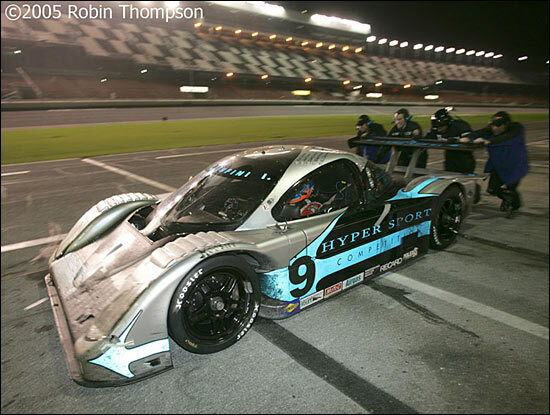 Their Daytona Prototype Doran is sitting in the shop, polished and ready to race. The team has replaced the Infiniti engine, last seen in the car at the 2005 season-ending Homestead Test Days, and the plan is to run the car again in mid-2007 with a Ford V8. In the interim they will continue to press ahead with their successful Grand-Am Cup program, spearheaded by Scott Maxwell. The team is actually part-owned by actor Patrick Dempsey. Unlike many wealthy-celebrity-owner-drivers, Dempsey is taking a very systematic approach to his racing career. He wants to gradually build up his skills and only when ready will he step aboard the DP.